Let us help you create your own personal safari experience. Our tailored African holidays combine unforgettable wildlife encounters with the very best camps and guides. 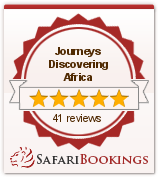 We are one of the preferred travel companies for savvy travellers from around the world, and we always work our hardest to ensure you get the best African safari possible, at the best possible price. We are members of the Travel Trust Association. Today, booking through a trusted tour operator is essential for your peace of mind. Thanks to our membership of the TTA, you can book a safari or tour with us, and rest assured that your trip and finances will be protected. The safari holidays offered to you by Journeys Discovering Africa give you the chance to explore some incredible scenery, exotic wildlife and authentic cultures from popular East African destinations including Uganda, Rwanda, Kenya and Tanzania. At Journeys Discovering Africa we aim to make your wildlife safari as fun and as memorable as possible which is why we offer a wide range of comfortable and luxury accommodation to help you relax and interact with wildlife in their natural habitat. The Albertine Rift Valley (the western wall of Africa’s Great Rift Valley) provides some of the richest and most diverse habitats on the continent, and is home to many of Africa’s Great Lakes. The largest lake, Lake Victoria, is the Victorian source of the River Nile. The diversity of habitat and scenery gives the area unparalleled and remarkable variety of wildlife, including big game and primates, as well as spectacular views that can literally take your breath away. Our safari holidays allow you to make your dream safari a reality and enjoy unforgettable experiences in boutique safari lodges and luxury hotels, making it the most comfortable and enjoyable way to appreciate East Africa. Our passion for East Africa is easy to see the moment you arrive. With so much to see and do, from tracking the majestic mountain gorillas in Uganda and Rwanda, cultural interactions with local communities and ancient forest tribes, to classic big game experiences in the savannah parks of Uganda or Kenya, Journeys Discovering Africa team guarantees that you will enjoy the experience of a lifetime when you join us on a safari holiday.